Hongqi (Chinese: 红旗; pinyin: Hóngqí) is a Chinese luxury car marque owned by the automaker FAW Car Company, itself a subsidiary of FAW Group. Hongqi was launched in 1958, making it the oldest Chinese passenger car marque. In Chinese hongqi means "red flag", a Communist Chinese cultural symbol. Originally, Hongqi models were only for high-ranking government officials and remained in production until 1981. The brand was revived in the mid-1990s. While the name has endured, the vehicles that bear the brand have been surprisingly varied. The erstwhile dignitary's car has become a taxi, a cut-rate businessman's sedan, and during the 60th anniversary of the People's Republic of China parade, returned to its roots and participated by carrying party leaders. If there is a common thread linking the disparate Hongqi cars besides brand name, it may be the fact that nearly all are based on modern technology. Today, party officials commonly prefer Audis. The original Hongqi cars were a luxury item used for the transport of foreign dignitaries and the party elite. Although Chairman Mao claimed not to have been driven in a Hongqi until Nixon's 1972 visit, he did take a personal interest in the cars from the beginning. Introduced on August 1, 1958, the first Hongqi was the CA72. By September, a convertible version intended to be used by dignitaries in National Day parades had appeared. The CA72's design was based on a 1955 Chrysler. From the beginning, the full-size Hongqi was equipped with a 147 kW (200 PS; 197 hp) V8 engine. The grille was based on a traditional design of a Chinese fan, and still remains in use on Hongqis today. First introduced in 1963, the CA770 model remained in production until 1980 albeit in limited numbers. Around 1,600 of these V8-engined Hongqis were built in total, and over the years various versions were released including a 1965 long-wheelbase model with three rows of seats and a 1969 armored version (CA772). Between 1995 and 2006, foreign products were manufactured in China and sold as Hongqi models. These included the Audi 100 (CA7200/CA7220) and the Lincoln Town Car (CA7460). There were two Audi 100-based versions—the more luxurious "Century Star" and the smaller (1.8-litre) Hongqi Mingshi. FAW began production of the latest Hongqi to go on sale in 2006. Named the HQ3 and based on the Toyota Crown Majesta, it saw little market success. First year sales totaled near 500, and while the target for the second year was 1,400 units, the HQ3 would not be profitable until annual sales of 5,000 were reached—something that may never have happened. By October 2008, the price was reduced considerably and the name changed to Shengshi (“Days of Prosperity") in order to better appeal to private buyers. Sales during the first half of 2008 were all from inventory and totaled 788. Debuting by 2013, 30,000 units of the latest Hongqi model were initially expected to be produced although a year after launch, less than 5,000 had been sold. Sales are through government procurement; the car is billed as "the official car for minister-level officials". In 2014, the People's Liberation Army purchased at least 1,000 H7 models. A much more expensive model, the L5, was also on sale alongside the H7. 1982–1984 CA750/CA760 红旗 Red Flag A sedan made by Hongqi with Datsun 280C styling cues. Was produced to compete with the Shanghai SH760. A long wheelbase version was also available as the CA760 with only one made. Hongqi will sometimes put in an appearance at autoshows held on Chinese soil showing off a concept car that attracts attention. At the 2005 Shanghai International Auto Exhibition, a Hongqi HQD concept car was displayed. 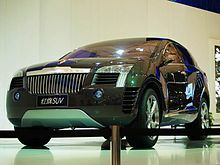 A Hongqi SUV concept was unveiled at the 2008 Beijing International Automotive Exhibition. At the 2015 Shanghai International Auto Exhibition, Hongqi displayed a concept SUV radically different from its 2008 entry. Not strictly a concept car, the V12 powered HQE was used by high-ranking Hu Jintao during parades celebrating the 60th anniversary of the People's Republic of China. It appeared on an official list of upcoming models in 2010 with a retail price of 1.2 million US dollars (which would have made it the most expensive Chinese-built car in history). This model has since been shown at the 2010 Beijing Auto Show as the CA7600L. It is equipped with a 300 kW (408 PS; 402 hp) 6.0 L V12 engine developed in-house. Hongqi and another FAW Group brand, Besturn, have exhibited some overlap. In 2008, due to flagging sales, Hongqi showrooms were merged with those of the then recently developed Besturn brand. It was thought that giving the Hongqi brand more sales outlets would increase turnover. At the 2010 Beijing Auto Show Besturn models were shown "under the Hongqi naming series", and until 2011 the two brands both used the Hongqi "circled one" badging. A total of 2,534 Hongqi vehicles were sold in China in 2013, making it the 67th largest-selling car brand in the country in that year (and the 41st largest-selling Chinese brand). Hongqi sold 2,774 cars in 2014 and became the 72nd largest-selling car brand of China. The Hongqi L5 was reviewed by Jeremy Clarkson in a film for The Grand Tour taking place in China. Armed with western luxury cars, Clarkson and the other presenters seek to prove that western luxury cars are superior, with a series of performance challenges. ^ a b c d e f "Hongqi Luxury Car". faw.com.cn. FAW Group. Archived from the original on June 18, 2004. ^ a b c d Ally (2008-10-09). "FAW Car cuts price of luxury HQ3 sedans hugely". Gasgoo.com. ^ a b c "Hongqi Brand". First Automobile Works. Archived from the original on 2011-05-13. Retrieved 2011-04-17. ^ a b c "FAW Announces Plan to Revive Hongqi Limousines". ChinaAutoWeb.com. August 26, 2010. ^ a b Piazzi, Giuseppe; Sidoli, Carlo (January 1985). "Sognando l'Auto" [Dreaming of the Car]. Quattroruote (in Italian). Milan, Italy: Editoriale Domus. 30 (351): 51. ^ Gao, George (2008-05-12). "Hongqi to launch a new model each year, starting with HQE". Gasgoo.com. ^ a b c d e "Mao's Red Flag Returning To Drive China Leaders From Audi: Cars". bloomberg.com. Bloomberg LP. Feb 27, 2012. Retrieved July 5, 2012. ^ Fei, Liang (11 Nov 2014). "Hongqi L5 under spotlight at APEC meeting". globaltimes.cn. Global Times. Retrieved 21 May 2015. ^ a b c d e Lienert, Paul (Apr 25, 2012). "FAW's Hongqi Shows Two New Luxury Sedans: 2012 Beijing Auto Show". insideline.com. Edmunds.com. Archived from the original on November 12, 2012. Retrieved July 5, 2012. ^ Huifeng, He (19 May 2014). "Domestic car brand Hongqi sells 1,000 cars to Chinese military". scmp.com. South China Morning Post. Retrieved 19 May 2014. ^ "$803,300 Chinese Car Goes on Sale". bloomberg.com. Bloomberg LP. Apr 19, 2014. Retrieved 19 May 2014. ^ "Japanese car styling at the end of the Cultural Revolution". ^ a b "Spotted in China: Hongqi CA7200". ^ "Spotted in China: Hongqi CA7220". ^ a b c "Autosoviet: CHINESE CARS". Retrieved 20 April 2017. ^ a b "All The Hongqi Stretched Limousine Variants Based On The Audi 100/200". ^ a b c "Spotted in China: FAW-Hongqi CA7460". Car News China. 27 May 2010. Retrieved 20 April 2017. ^ a b World of Cars 2006·2007. Warsaw, Poland: Media Connection Sp. z o.o. 2006. p. 231. For 2010 end date, see "Mao's Red Flag Returning To Drive China Leaders From Audi: Cars". bloomberg.com. Bloomberg LP. Feb 27, 2012. Retrieved July 5, 2012. ^ "FAW Hongqi SUV concept unveiled at Beijing show". Automotive World. 21 April 2008. Retrieved 26 February 2014. ^ Halas, John (21 April 2015). "Hongqi LS5 Is Something Like China's Range Rover For The Rich". carscoops.com. Carscoop & Carscoops. Retrieved 10 April 2016. ^ "The Most Expensive Chinese Car, $1.2-Million Hongqi HQE, is Getting Ready for Volume Production". ChinaAutoWeb.com. ^ a b Jurnecka, Rory (2010-04-23). "2010 Beijing: FAW Red Flag Limo is Chinese for Old-School Luxury". Wide Open Throttle. Motor Trend. ^ "Besturn B90 Sedan spotted out testing". China Car Times. 2010-10-27. ^ "2013 Passenger Vehicle Sales by Brand". China Auto Web. 15 January 2014. Retrieved 4 March 2014. ^ "【搜狐汽车产销库_汽车产销数据】_搜狐汽车网". db.auto.sohu.com. Retrieved 23 April 2018. ^ "'Chinese food for thought' – The Grand Tour Series 3 Episode 6 Preview – MotoringBox". Retrieved 2019-04-19. Wikimedia Commons has media related to Hongqi automobiles. This page was last edited on 22 April 2019, at 20:53 (UTC).